Welcome to day Eight of the TJ Blogstravaganza! I sure hope my ideas are inspiring you to get your Holiday cards and gifts done. 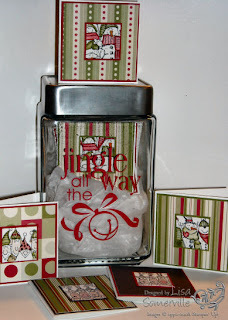 Here's another Jingle Jar idea...in case you missed the posting of my first Jingle Jar, you can view it here. For this jar, I used the small Jingle all the Way Decor Elements in Red, and adhered it to this cool glass canister style jar I found at my local WalMart. (Hmmm....maybe I shoud run out and by more now that I told you were to get them!) Then made 10 - 3" x 3" cards using the Holiday Lineup stamp set, some retired DSP, and DSP from Ski Slope and Holiday Treasures. My images were all stamped in Black Archival, then colored various techniques. I used Marker Watercolor from a past TJNL, Shimmerz and Twinkling H20's. Punched my images with the 1-1/4" Square Punch, then layered them on a 1-3/8" Square Punch, onto my DSP, coordinating card stock and 3" x 3" base card. Be sure to stop by Pat's blog to see her post, and those of the other TJDT member's who are playing. Really, really cute! What is in the bottom of the jar? I can't quite make it out. Super Cute Lisa. Your recent projects have inspired me to get some shimmers and blings. I can't wait to use them.